A Comprehensive Guide To Gracefully Letting Go Of Wrong-Fit Team Members. 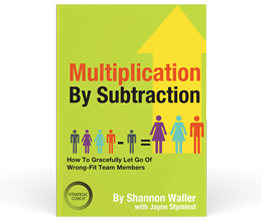 Multiplication By Subtraction is an indispensible handbook on why, when, and how to let go of wrong-fit team members. This is a book written to directly address this and to inspire courage and confidence when it’s necessary to say goodbye to team members who are no longer a right fit for your company. Keep this book on hand as a reminder that endings are necessary on the path to reaching your most important goals. When it comes to building and rebuilding teams, this book answers it all. Multiply results by subtracting the wrong person. This book is your team-building resource. President, Davis Bews Design Group Inc.
Strategic Projects Manager, Davis Bews Design Group Inc.